Does “real” maple have health benefits? If you have heard anything about pure maple syrup, it’s likely you’ve been told that it was one of the more healthful sweeteners. Well, good news it’s true! Why is maple syrup on a chart in the middle of a table with fruits and veggies? That’s because maple syrup contains a high value of antioxidants. Even higher than some fruits and vegetables we regularly consume… Antioxidants are essential to the body, as they neutralize free radicals that can cause the body harm. While the body does require some free radicals for the immune system to function effectively a balance must be kept to remain healthy. Stress and poor health habits can cause an increase in free radicals which means more antioxidants are needed to maintain a healthy balance. 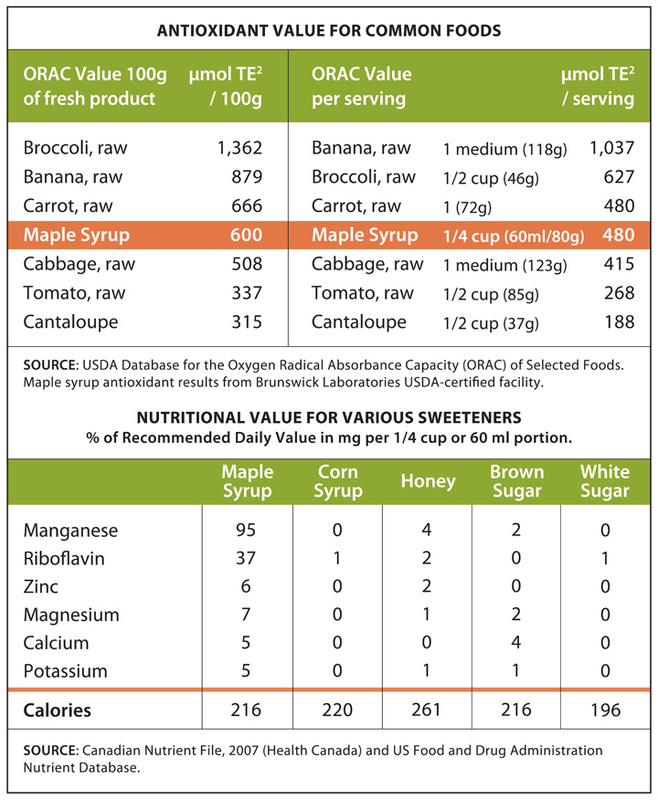 Also, seen in the adjacent table compared to other sweeteners, none come close to having the naturally occurring vitamin and mineral values pure maple syrup does. Studies have shown the presence of Zinc in ones body is one of the best ways to promote a healthy heart. Inversely, deficiencies in Zinc and Magnesium can cause a reduction in ones white blood cell count. White blood cells are what the body’s immune system uses to fight off illnesses. Nutrient deficiencies like the one just listed have also been linked with an increased risk of things such as prostate cancer in men. Maple syrup naturally contains those nutrients in higher volumes than any other sweetener. The glycemic index is a value that is assigned to foods we eat which tells us after consumption how fast or slow that food will effect our blood sugar values. The lower the number the slower your body will digest the sugars in that food and it will result in less high blood sugar peaks. Above normal blood sugar levels (A.K.A Hyperglycemia) can lead to kidney damage, cardiovascular disease, blindness and nerve damage. Glucose has an index of 100 whereas, pure maple syrup has an index of 54. Indexes under 55 are considered by most to be a low index food. Drinking maple syrup by the bottle is not recommended. Consuming maple products in massive quantities will not fix all of our problems. This page’s purpose is to show that compared to other sugars and sweeteners commonly used not one comes close to pure maple syrup. Therefore, we hope you’ll join us in replacing some of the sugars you already consume daily with maple sugar. If you put standard table sugar in your coffee, replace it with pure maple sugar. If you frequently bake goods with white refined sugars try replacing that with pure granulated maple sugar. Instead of frosting your cupcakes with store boughten frosting, spread some fresh maple cream on them or make a boiled maple frosting with pure maple syrup and egg whites. 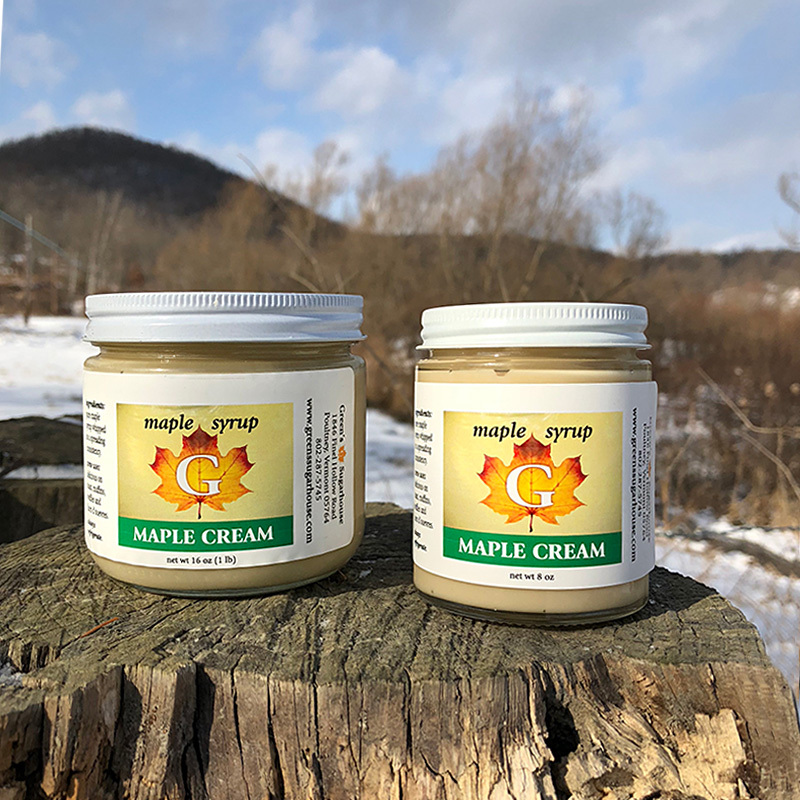 The only ingredient in our pure maple cream, granulated maple sugar, maple sprinkles, maple candy, and maple syrup is concentrated maple tree sap… And it’s delicious!!! As you may already know, or have seen, maple sugar can come in a large variety of forms. Maple Syrup, Maple Cream, Maple Candies, and Maple Granulated Sugar are all single ingredient products that consist of boiled down maple tree sap. 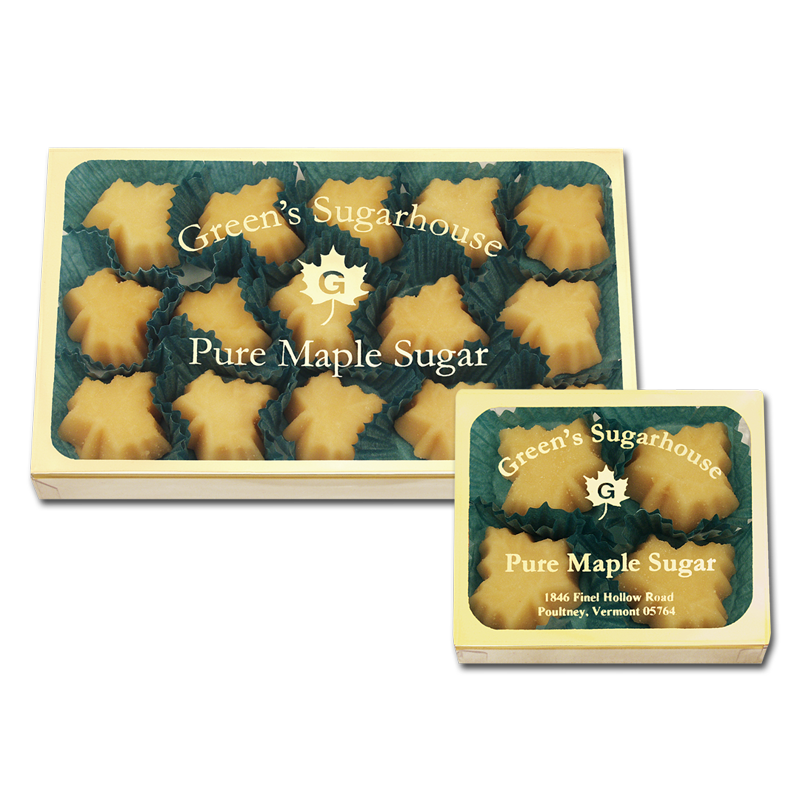 Some just have more moisture in them than others–Maple syrup has the most moisture, then Maple Cream, then our Maple Candies, and lastly Maple Granulated sugar is the pure maple sugar from the tree after all the moisture has been evaporated. Therefore, these products must be substituted differently in your recipe based on their moisture content and what the recipe calls for. Our pure maple granulated sugar can be substituted anywhere you would use another granulated sugar at a ratio of 1:1. Very simple. For maple syrup if a recipe calls for 1 cup of white sugar it should be replaced by 3/4-1 cup of maple syrup. For every 1 cup of syrup you use, decrease whatever liquid is called for (cream, milk, water) by 2-4 tablespoons. Unless your recipe already calls for buttermilk, sour milk, or sour cream you should add 1/4-1/2 teaspoon of baking soda. Lastly, any batter containing maple sugar will caramelize around the edges a little quicker, therefore we recommended to turn the oven temperature down about 25 degrees. Depending on what you are looking to get out of your recipe while using maple you may want to use a certain flavor classification in a your recipe. For instance, if you are using syrup in a recipe and would prefer a strong flavor of maple coming through, you should use the Very Dark maple syrup with strong flavor to achieve that. Enjoy experimenting with the maple flavors of Vermont! 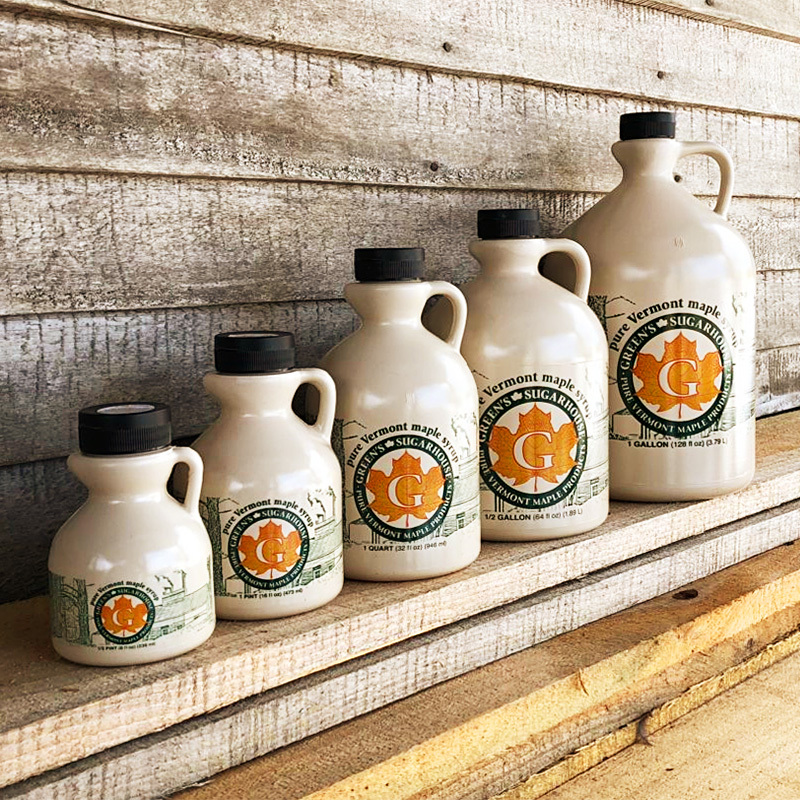 To receive maple recipes for free follow us on FaceBook at Green’s Vermont Maple Sugarhouse or sign up for our mailing list.